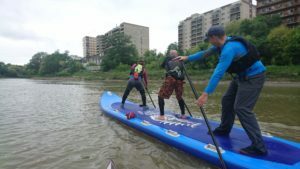 Introducing Winnipeg’s newest river adventure: Monster SUP stand up paddleboard tours! Experience Winnipeg from a whole new perspective. Travel down the Assiniboine River on a 20′ Monster stand up paddleboard with five other paddlers and our professional river guides. Activity level is minimal and adventure is high. Come have an adventure with us! Space is limited and spots do fill up quick. 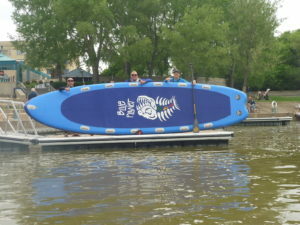 Register today to save your spot on board the monster SUP! No SUP experience is necessary. Participants must be at least 16 years old. We will meet at the Forks at a pre-arranged time. From there we will hop into our shuttle vehicle and transport everyone to the start of our river adventure. Our journey concludes upon arrival at the Forks. Participants are invited to join us for a post-float beverage after the tour is over. Custom and private dates and tours are available. Please contact us to discuss your specific needs. Custom and private dates and tours are available. Please contact us to discuss. Our monster SUP is perfect for corporate activities, family gatherings, bachelor/bachelorette parties, or just a fun outing with your friends! All participants will be provided with the required safety gear for the tour (paddle, helmet, PFD, & whistle). You will need to bring your own personal gear and clothing. Contact us if you have any questions regarding gear. Clothing: quick-dry or warm-when-wet outdoor athletic gear. Think paddle tops, rashguards, breathable hiking layers, merino wool, boardshorts, athletic swimwear, etc. Secure protective footwear such as water shoes, paddle shoes, neoprene paddle/surf booties or sport sandals. Waterproof and floatable camera or Go Pro. Dry bag to store any of your items on board the monster SUP.